For fun, I like to see trends. And I like to use the functionality of an old Excel spreadsheet. I use Excel 2003 – it just seems most comfortable to me. I have updated version of Excel which I use but I still always seem to go back to the 2003 version. Just my preference. I make these charts based on data from Allergan’s Brilliant Distinctions – I also keep track of other Botox Statistics related to our Modesto Botox Practice. I also have 2013 Modesto Botox Statistics. I’m getting ready for 2014 Botox Statistics, but 2014 isn’t completely over yet. In fact November isn’t over yet either, but the next working day is Dec 1, 2014. Botox Patients Per Month. Click larger. The dip in September 2014 for Botox patients is due to a two week vacation away from the office. The much of the vacation was work related. With visits to other Botox practitioners, Acupuncture centers, and Qi-Gong lessons. The orange arrow was drawn in by hand; there was no mathematical method done for the rendering of that line. December 2014 is missing from the chart because December hasn’t come about yet. It’s interesting to see that the growth so far seems to be linear. The chart starts with the very beginning of 2011 where a large part of my practice included General Surgery, Veins, and Acupuncture. We await December to finalize the 2014 number above. This linear growth will start to level off in 2015. Why? Because I am totally running out of appointment slots. That’s fine with me. I’ve made peace with the idea that I’m not aiming to be busier. I just am just aiming for higher quality with each visit. I’m looking forward to December 2014, and a New Year 2015! I’ ve been playing around with Botox’s Brilliant Distinctions reporting. Brilliant Distinctions is a rebate/coupon type program run by the Allergan company for our Botox patients. I pulled up a custom report with the dates in November 2014, and selected it to produce a list of Botox patients. This is in the analytics section. Then I look at the reports on an excel spreadsheet. I also keep my own Modesto Botox and Juvederm Brilliant Distinctions Statistics. The results reveal a grand total of 96 patients seen for the month of November, 2014. November has typically been a busy month for Botox at our Modesto Botox Practice: Surgical Artistry (Injections by me: Calvin Lee, MD). 96 Patients – well, this hasn’t been our busiest month this year. I did hit over 100 patients last month. 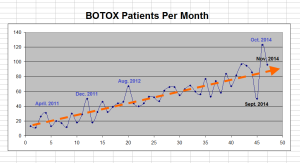 A while back, I wrote a blog regarding the elusive 100 Botox patients per month goal for my Botox practice. Botox and Fillers takes up half of my practice; meaning it takes up half of the practice when using time as a measure. So it takes up half the time – stated more simply. October, which is last month, revealed a large surge of Botox patients into our office with 123 patients seen. 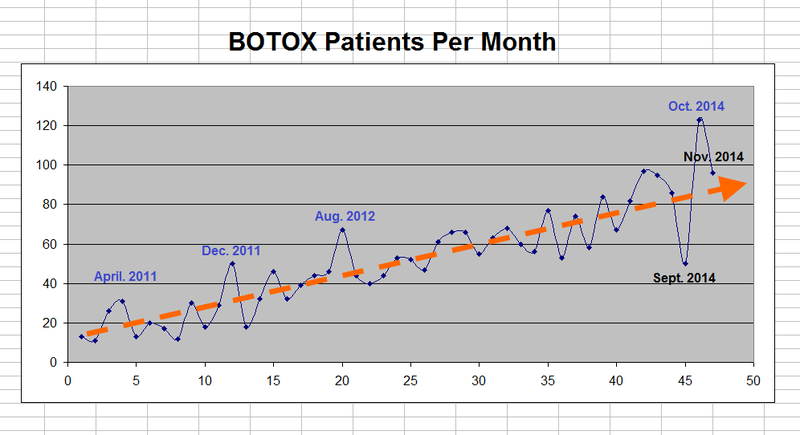 Overall, I think the Botox trend is an upward one. Perhaps this is a reflection of the overall economy. Excuses for not hitting 100 Botox patients this month? (with Thanksgiving in it). Well, there aren’t much excuses except that it isn’t that big of a goal for me anyway. My main goal is excellent results with Botox – not huge numbers of Botox patients. But Allergan’s Brilliant Distinctions Analytics does make it fun to extract these numbers. And… December is another month to look forward to. This is a question I get in my Modesto Botox Practice – Surgical Artistry – almost every single day. It’s a difficult one to answer because everyone is different. But I’m going to attempt to answer it in this blog. Not to worry, I don’t use a hammer when injecting BOTOX. What are some causes of pain with BOTOX shots? Injection technique – “hands of a woman, heart of a lion, eyes of an eagle” – a strange mantra passed on to me by a surgery mentor while I was a Surgeon-in-training. There is so much to this topic – it wouldn’t all fit here. Size of the needle. Smaller is usually better. Did we hit bone? ouch! But sometimes this is part of the technique to gauge depth. Not usually necessary though – in my humble opinion. Is the needle dull? – a dull needle causes more pain. I have found that needles – even from the same batch might be sharper or duller when brand new out of the box. Did the needle become dull? It could become dull after a few shots (same patient of course!). The Botox injector could change the needle after a few shots to start “fresh.” Or the needle could become dull if it was purposefully or inadvertently “banged” against certain anatomic structures such as bone, or it could have been used to extract the Botox from the sterile bottle (not my practice – though). How often are we going to change the needle? Changing it often is a good thing, especially with the smaller needles. Smaller needles dull pretty quickly. Did we hit a nerve? This would hurt. Did we hit a blood vessel? This would hurt too. Nervous patients usually feel more pain. Tensed muscles usually get more pain. Patients who squirm around during injections usually suffer more pain. Patients who haven’t experienced raising children (or birthing them) usually experience more pain. Pain is a very individual experience. But I’m glad to report that lots of patients like their BOTOX visits and come back regularly for more BOTOX visits. I think that tells me that it isn’t a really terrible pain. And I consider myself to be the biggest CHICKEN in the world (just ask my wife the Plastic Surgeon), and I think that BOTOX shots are just fine for myself. My wife, Dr. Tammy Wu, by the way, won the Best Cosmetic Surgeon award this year. I’m vegan, I need to find a different word for “CHICKEN.” – perhaps a future blog. Please see your own injector regarding Botox Pain Perception questions. Reading this blog does not automatically make me your doctor. Read at your own risk. Do not try this at home. The FDA has nothing to do with this web page. 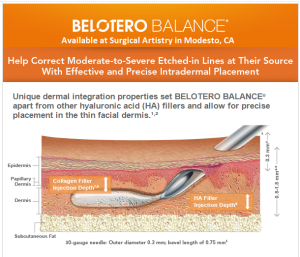 Please visit my Modesto Botox Home Page for more important information. 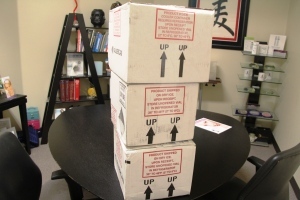 Botox Delivery – what it looks like in a box. Ever wonder what it looks like when BOTOX is delivered to an office? Here’s what the boxes look like. Inside these shipping boxes are styrofoam containers with dry ice on one side and individual BOTOX boxes on the other side. These three BOTOX containers added up to a shipment of 50 vials of 100U Botox. I have delivery of this amount of BOTOX before and it came in one large container – so I think it varies from time to time. I don’t see any obvious advantage to breaking up the BOTOX shipment. But perhaps Allergan decided that it was better that way – or they just simply ran out of larger BOTOX shipment boxes. A tower of Botox! Delivered to our door. Botox Delivery. No, it’s not pizza delivery. It’s much better than pizza! This is a picture at our Modesto Botox Office of Botox delivery boxes ready to be stocked and recorded (lot numbers). It needs to stay refrigerated. How is BOTOX and Wi-Fi related? Basically BOTOX shuts down the signal (this signal can be thought of as “WiFi” for your phone) between nerve and muscle. There is no alteration of the muscle – just like when the WiFi signal is shut off, there is no alteration to your cell phone. I’ve come up with this original analogy one day when talking to a patient who was cellular phone sales person. WiFi is a trademark name and is considered at this point, any wireless local area network for computers. First, in general, how does BOTOX work? Medical professionals consider BOTOX to be one of the most effective ways to maintain youthful beauty. In more detail: how is Acetylcholine involved with BOTOX? Acetylcholine is the signal for muscle contraction. Botox reduces the release of acetylcholine from the nerve endings. It is the acetylcholine, which is a neutrotransmitter messenger, which tells the muscles to contract. Without the acetylcholine released, the muscles stay in a more relaxed configuration because it doesn’t get that signal for contraction. Acetylcholine carries the signal for muscle contraction. Just like WiFi carries the signal for my internet connection. Botox works on reducing the signal. Anyway, that analogy is a fun one, and I’ve enjoyed using it in my explanations in my Botox Consultations at my Modesto Botox Center: Surgical Artistry. Yes and No. Yes, muscle CONTRACTION causes wrinkles. Thus if we cut the signal for muscle CONTRACTION, the wrinkle isn’t crinkled. But the muscle by itself in a relaxed state does not cause wrinkles. So the key word here is contraction. Disclaimer: I am by no means trying to say that Botox gives you a better WiFi signal. That would be interesting and probably very useful – but it doesn’t work that way. I was just trying to use some real life examples to explain Botox to my patients. Please see your Botox doctor, nurse, or aesthetician in person for a personalized discussion. There is no patient-doctor relationship set up by reading this article. Nothing here is medical advice. This is just generalized information. As of the writing of this Botox blog which is November, 23, 2014. Cosmetic Botox on the face is FDA approved for use in the glabellar complex and the crows feet. The glabellar complex is sometimes known as the “11’s” or the frown lines between the eyes. It is made up of more than one muscle – thus it’s a complex of muscles. And the crows feet, sometimes called fish tail, area of the eyes is the lateral wrinkles to the sides of the eyes. How about other areas of the face for Botox Injections? These two areas constitute the FDA approved areas for facial Botox in a cosmetic sense. There are other areas on the face – in fact many other areas – which have not received FDA approval, but these have been commonly done for the past decade. And Botox injections in these other areas of the face is considered off label FDA for Botox usage. Please consider visiting your Botox injector for one-on-one discussions. If you are near us, consider visiting our Botox practice in Modesto, CA. And if not us (Surgical Artistry), then there are these other places in Modesto to get Botox. The Botox listing of injectors is not an endorsement; it is just a courtesy listing of other practices in Modesto who offer Botox. Belotero Serial Puncture or Serial Killer? 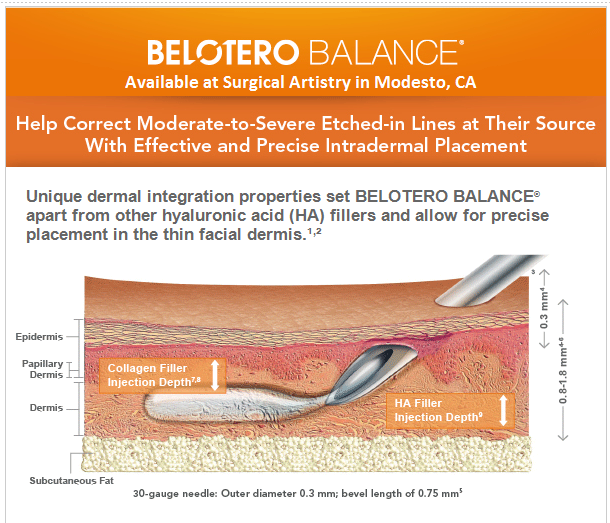 Belotero offers a dual cross-linking process of the hyaluronic acid which offers a natural-even integration into the dermis. I have my own version of this technique, but it’s more of a “submarine missile attack” (more on this someother day). Actually I personally think that my idea is superior – well at least in my small hands. Typically, the dermis measures approximately 1.8 mm in depth. Once the bevel is buried, filler can then be deposited accurately within the dermis. Then repeat the process multiple times per wrinkle line. *Bevel measurement based on the needle included with the BELOTERO BALANCE syringe kit. Superficial injection of Belotero works! We get this question from time to time regarding matching the lowest price of Botox or Juvederm. It isn’t a common question, but it comes up perhaps once per month or so. I figure it’s worth addressing. 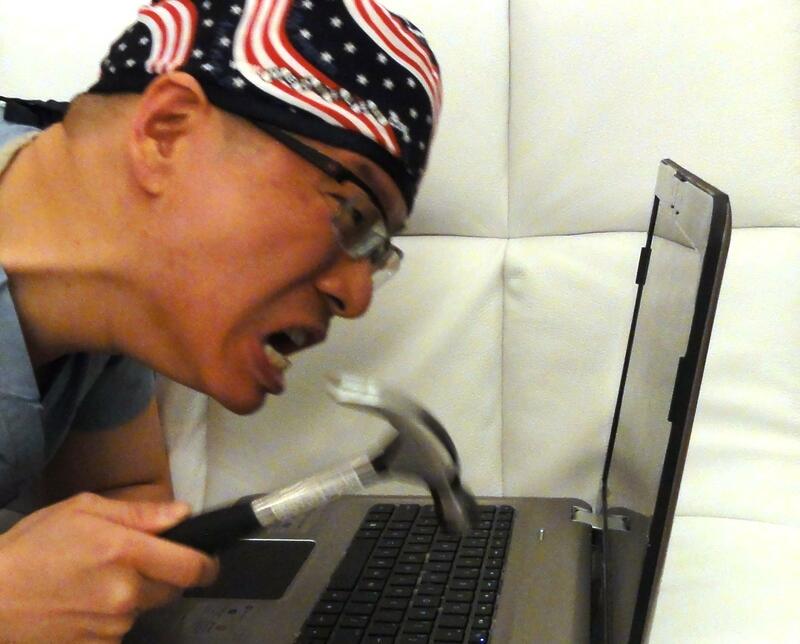 So, do we price match or compete on pricing? But we like to compete on “value”. But in the end, we don’t see this as a competition. We have a lot of respect for everyone. We have set prices that make sense to us. So the long answer is that we hope that we are considered the “best value.” But all this depends on what patients value. It might be different than what I might value. So I can definitely understand different definitions of value when it comes to Botox injections. Surgical Artistry doesn’t emphasize or compete with “cheapest” prices. We hope to win with BEST VALUE. I think we would lose the battle if we were going for price wars on Botox. But hopefully we might win with best value – that’s our attempt. Here’s a link to another topic of Botox Wars – The fight for Allergan Ownership.